Sexual Orientation - Nature or Nurture? The book Micropsychology by Yehuda Salu treats the brain as an information handling system. It introduces the basic mechanisms that the brain uses to acquire new information, organize it in information structures, retrieve it, implement it in physical and mental activities, and create new information from existing one. The book brings examples from various situations to illustrate how combinations of those basic mechanisms end up in observed human behavior. 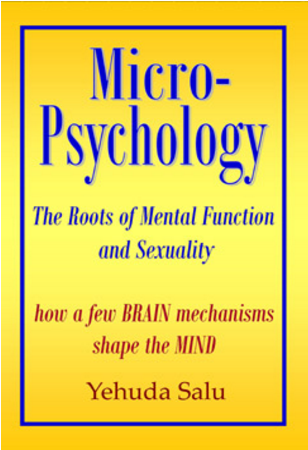 Included in the examples are: The development of sexual drives that shape sexual arousal habits and sexual orientation; learning mechanisms, understanding and perception, intelligence, and more. Recent scientific discoveries are introduced in down-to-earth, entertaining, yet accurate presentation. Paperback: 232 pages Publisher: CreateSpace (March 18, 2008) Language: English ISBN-10: 1434847810 ISBN-13: 978-1434847812 Product Dimensions: 9 x 6 x 0.6 inches Shipping Weight: 14.4 ounces. Bookstores and bulk orders: please contact us to request a quote.